1 of 4 Heat oven to 425 degrees F. Coat 2 mini-muffin pans with nonstick cooking spray. 2 of 4 Blend cornmeal, flour, sugar, salt and baking powder in a large bowl. 3 of 4 Stir together eggs, oil, hot pepper sauce, milk, 1/2 cup of the cheese and the corn in a small bowl. Stir into cornmeal mixture just until dry ingredients are moistened. Divide evenly among prepared muffin cups, 1/3 cup per indentation. 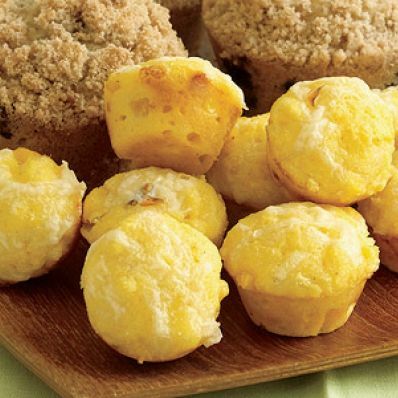 Sprinkle muffins evenly with remaining cheese. 4 of 4 Bake at 425 degrees F for 15 to 17 minutes or until a wooden toothpick inserted in center comes out slightly moist with crumbs attached. Run a thin knife around edge of muffins and remove to a wire rack to cool. Serve slightly warm. Per Serving: 1 g fiber, 116 kcal cal., 40 mg sodium, 1 g sat. fat, 3 g pro., 15 g carb., 5 g Fat, total, 24 mg chol.